If you’ve watched enough skydiving videos, you’ve seen a huuuuuuuge range of outfit choices represented: among them Santa Claus suits, haute couture, mascot getups, and not much at all, really. It might seem like your choices are endless. Well, in one way, they are. You’ve seen the proof. In a more realistic way, however, there is a best way to dress for skydiving. It’ll keep you comfortable, protected and agile when you really want to be comfortable, protected and agile. Leave the costume stunts to the professionals and take our best advice. The right skydiving shoes are key. Chose a comfortable, supportive pair that laces up tightly. Before you board the plane, make sure they’re tied nice and tight, ‘cause freefall loves to pull loose shoes from unwary feet. Heels are a no-no. Because of the atmospheric phenomenon called “lapse rate,” temperatures are about thirty degrees lower at altitude than they are on the ground. In wintertime, that can be cold. Happily, when the adrenaline is pumping, you don’t really feel it — and you can fix yourself up by choosing the proper skydiving clothing to set you up for a warmer experience. Here’s where the layers come in. For skydiving, it’s best to eschew one thick layer for several thin ones. You’ll be significantly comfier and more agile up there. It’s almost magic how much warm air thin layers retain. (That’s because they sock it away in the air spaces in-between.) Long layers — as opposed to short sleeves and shorts — will keep your skin protected from the cold air and strong sun at altitude, no matter what the season. That said, you can bring bulky layers for the ground — and if it’s cold down there, we heartily suggest it! You’ll be glad you have it when you land and all those brain chemicals stop distracting you from the chill. Choose clothing without fancy details (or anything that flaps if you stand in front of a fan). Those bits have a tendency to whack around painfully and/or tie in unreleasable knots in freefall. Leave jewelry at home. Freefall will eat it. Total no-brainer. If you wear glasses, we can provide you with goggles to fit over them, but bring Croakies to keep them firmly on your face. Want even more comfort and protection? We quite literally have you covered. You can borrow one of our skydiving jumpsuits and pop it right on over your clothes. It’s not dorky to do so: You’ll notice that most solo skydivers choose to wear jumpsuits to protect their own clothing (and skin) against dirt and damage. Result: You looks pro in your tandem skydiving video. Nice. Here’s the deal: Sweat is probably going to happen. (This is a sport, remember?) If your plans after your jump include going someplace that you wouldn’t happily walk into straight from the gym, you’ll be happy you brought a change of clothes. 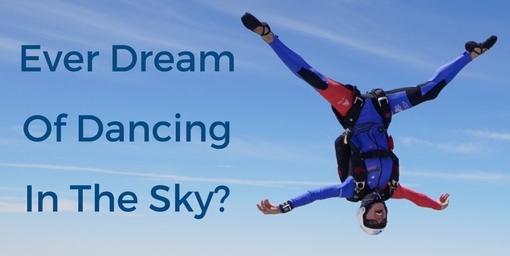 When you’re choosing something to wear for your tandem skydive, remember: When you make that jump, you’re in essence trying a new sport on for size. Pick out clothes that are comfortable, flexible and buildable in thin layers. Aim towards comfort and cover and away from bulk and restriction. With those simple suggestions in place, you’ll have a comfortable jump no matter what the weather — and your freefall smile will be epic!